It's Friday afternoon and, as part of an assignment for Salt Lake Community College, I'm en route to meet with Guinnevere Shuster, a professional photographer and social-media coordinator for the Humane Society of Utah. We were to interview Salt Lake City locals, and I couldn't believe my good fortune at being able to meet with her. To call her just a photographer does not do her skill set justice. 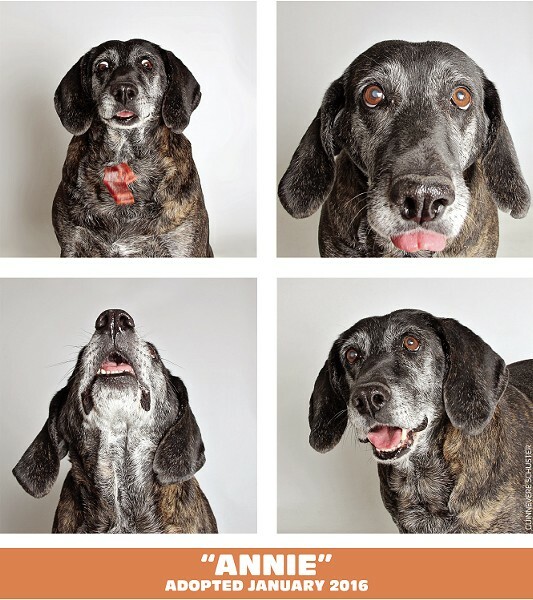 Her photo-booth-style shots shared across the Humane Society of Utah's social platforms are poignant, playful and the definition of sharable. I first came across her work on Facebook and quickly realized she is the David LaChapelle of labs; the Dorothea Lange of Lhasa apsos, if you will. Arriving at the Murray-based facility at 4 p.m., I'm surprised with how busy the shelter is on a weekday afternoon. Waiting by the front desk, I watch, through organized chaos, numerous people and pets are coming and going along with the expected cacophony. Potential adopters walk to and from the dog run with their chosen pooches on a leash to get a sense of whether or not they belong together. There's a small pen set up directly behind the front desk housing three caramel-colored wiggly puppies with a sign next to them stating the importance of sanitizing your hands before touching. I find myself on tiptoes with my body bent in half at the waist in an attempt to lean closer over the counter to get a better look. As a dog lover, I would gladly have bathed in a tub of sanitizer for a chance to climb into that puppy pen. Before I'm able to impose myself on the innocent furballs, Shuster shows up and introduces herself with a smile and a handshake and suggests we head to her office, where it's quieter. Her workspace is a modest square cubicle with a desk, a window and a couple of small tables. Her photos are strung across her computer. Every surface is covered with papers, animal toys and paraphernalia. There is one spare chair that I pull close to her desk. As I'm about to sit down, I slip on a pink plastic stick with a string and feather attached to the end. It's clear to me Shuster quite possibly has the best job on earth. I notice a plastic end table that pulls double duty as a hamster enclosure. In a weak attempt at small talk, I tell the story of my own childhood hamster, cleverly named Hammy the Hamster. Shuster doesn't seem impressed. The 33-year-old is dressed comfortably in an oversize maroon T-shirt with a matching headband holding her long hair in place. She's rocking an ever-so delicate nose piercing and patterned leggings, and tennis shoes complete the ensemble. I get the feeling it's been a long day, but she is warm, friendly and willing to help despite the fact she has any number of better things to do at the moment, such as preparing for Love Utah Give Utah, an annual event designed to support Utah nonprofits. Shuster's love affair with animals has been a lifelong one. Originally from upstate New York, she moved to Salt Lake City during high school and never left. "I grew up riding horses and was around farm animals. We always had dogs and cats, and I would bring home whatever I could find," she reminisces. "I think our dog had gotten it and I just didn't know, and he was on his last leg," she says. I tell her about my college assignment which is to spotlight a local citizen directly involved in social justice work. I tell her how monumental I think her work has been in giving animals a second chance, especially those that have been abused, mistreated or are otherwise overlooked. This promptly leads to a discussion about current animal abuse laws in the state. Following a national trend, some improvements have been made, but Utah still has a ways to go. 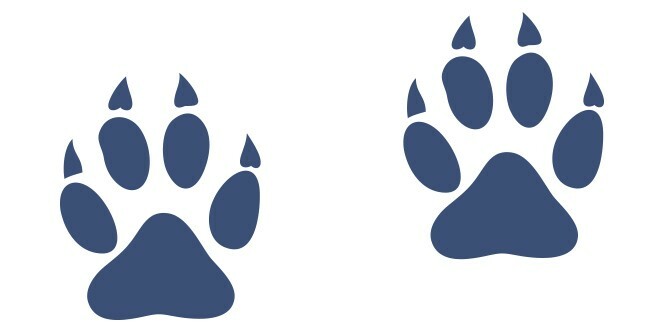 Utah's animal-cruelty laws are housed in Title 76 of the state's Criminal Code. Injury, abandonment, malnourishment and fighting animals for "amusement or gain" are all considered misdemeanors. Under current law, only abuse to service animals could result in a felony. Still, activists like Jeremy Beckham, president of the Salt Lake City-based Utah Animal Rights Coalition, has seen progress. "In a general sense, I think Salt Lake City is a leader in many areas. [We're] one of the largest cities in the country, for example, that has banned horse-drawn carriages; I'm almost surprised we beat New York City to that," he says. "Also, Salt Lake City is remarkably vegan-friendly for the size of our city, and I think one of the reasons that restaurants have so many vegan options, is because there is such a demand here ... I think that the people of Salt Lake care a lot about animals, and that's reflected in a number of ways." Statewide, Beckham says, "the picture is not that good." He cites that Utah is one of only six states in the country that have "ag-gag" laws—which forbid the use of recording and photography at factory farms and animal-processing plants without the express consent of their owners. Beckham breaks it down. "If you work, for example, at a daycare facility and you take pictures of child abuse and send those to the police, the police will rightly arrest the abuser in Utah. On the other hand, if you work at factory farm and take photographs of animal abuse and send those to the police, you'll be the one who's arrested." Shuster thinks laws as they stand are nothing more than a slap on the wrist. "Unfortunately, I don't think Utah does a lot for animals as far as laws and protection," she says. "Very few people are actually convicted of animal abuse on a felony level. I mean, you know, if there's enough media around it, it may happen. 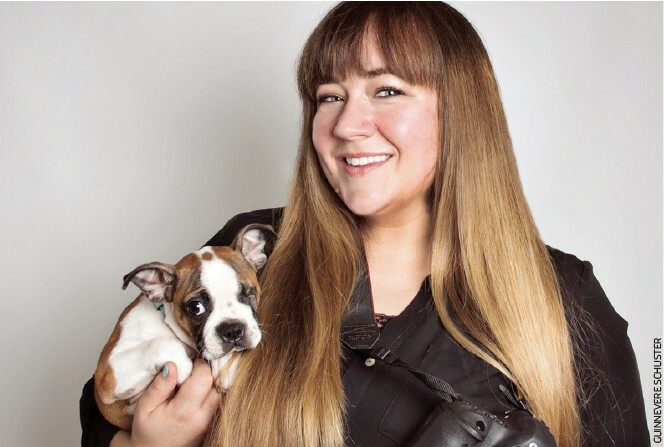 But, otherwise ..."
In 2011, after receiving a bachelor's degree from the U of U in photography and digital imaging, Shuster started volunteering at the Humane Society of Utah when a friend and fellow volunteer who had been taking pictures requested she take over. "So I started doing it and really enjoyed it and decided I would try to convince them to make it into a full-time job. And they eventually did," she says. Now a staffer for two and a half years, Shuster has developed a style that is very clean and direct. 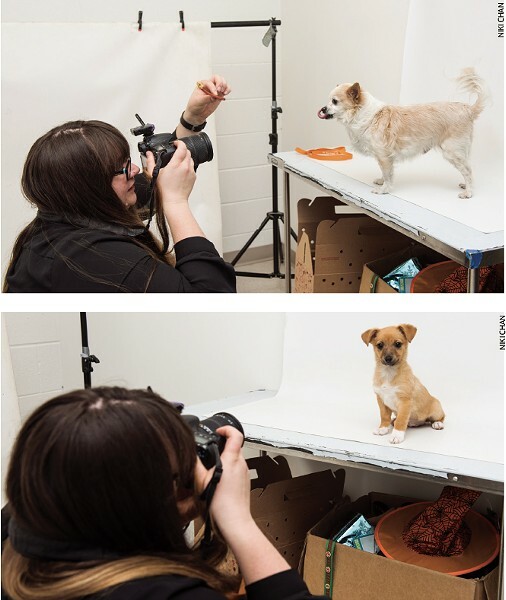 She shoots a headshot of the pooches in front of a white backdrop while plying them with treats, peanut butter or bubbles. She then chooses the best four shots that showcase the personality and uses them to create her photo-booth strip. It's a departure from what was once the norm. 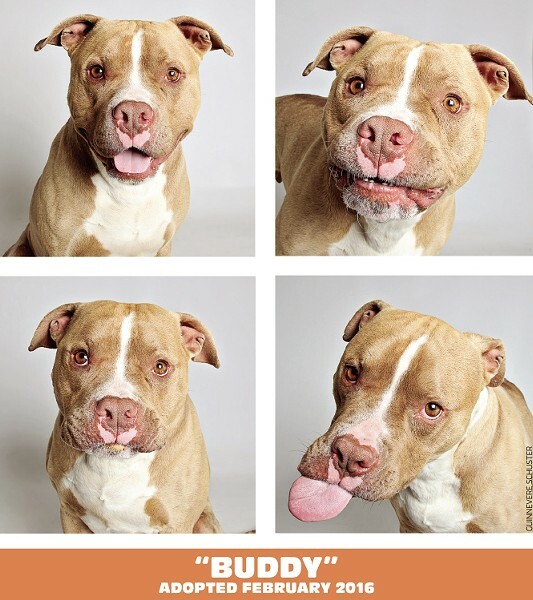 With a slight smile, Shuster describes what sounds like a tragically sad puppy mugshot—one consisting of a dull full body and side-view shots. Before her arrival, staffers would take the dogs out onto the grass while someone held the leash and a "here goes everything" shot would be snapped before returning the pup to its pen. While not as depressing as a poor mutt cowering in the corner of a cell behind bars, it was a far cry from the "like"-tempting shots of today. "Originally, we only used one photo for the website poster ... and then when I would take the pictures, it was really hard to choose just one," Shuster says. "So, then, I thought the photo-booth idea would show their personality a little bit better—especially when there would be a funny-looking picture where their eyes would be closed or something. That wouldn't necessarily be the best if you were using a single image." But because photos would be posted on Facebook, Instagram and other social media, she says, the square format with multiple shots worked best. Her dog whisperer-like ability to get animals to cooperate is evident. But as she recounts her experience with training dogs, horses and a stint at the Tracy Aviary working on the bird show, she plays with a set of keys she has in her hands, subtly shaking them up and down. I wonder if it's because she's nervous or because she's pondering the myriad other tasks she could be working on at the moment. If the number of times her phone is beeping or dinging (which she resolutely ignored) is any indication, I'm going with the latter. "You know, a lot of the dogs that come in here are actually really great dogs. They already know how to sit and shake and do commands like that. I think people would be surprised at how many dogs that come into the shelter are pretty well-trained," she says. 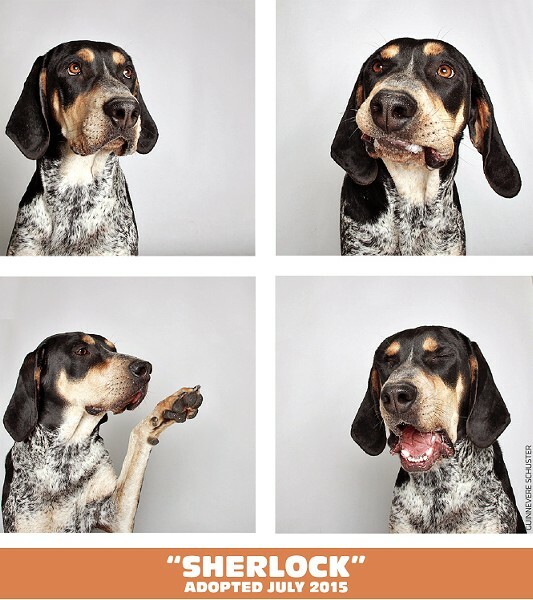 In an effort to diversify, Shuster has tried to shoot other types of adoptable pets, with varying degrees of success. "I have tried cats, but they don't tend to have as many expressions as dogs do, so it ends up looking like four shades of angry," she says. How good is the end product? When asked if she's ever been tempted to adopt her subjects, she smiles while looking slightly sheepish. "Ummm ... yes." "When I started working here, I had one dog that I'd had for eight years. Then, I adopted a dog that was here for about six weeks and had been in three homes previously." She points to one of three photos she has strung across her desktop computer like a mini photo banner. "He's a great, great dog. He's kind of like one of my muses for pictures. His name is Tubs. He's an oversize American Staffordshire terrier mix, and he loves to play dress up. And then, the other dog, the white one, I adopted about a year and a half after. Not necessarily from taking photos of him—he just was really scared and nervous and came from an unfortunate background. His name is Grant and he bonded really well with my other dogs," she says. "So yeah, I've got three dogs." With more than 10,000 placed animals, 2014 was a record-breaking for the Humane Society of Utah, which has the distinction of being an open-admissions shelter, meaning all surrendered pets are welcomed. Shuster knew her images could up the ante. "In 2015, we placed 11,318 animals, which is even more than 2014, and we achieved what you call 'no-kill' status for both cats and dogs, which is a goal we had set for 2018," she beams. Think of the designation, as the humane equivalent of being LEED-certified. "No-kill" means that a shelter does not kill healthy or treatable animals even when they are at capacity. While it sounds humane, not all are fans. An article on PETA's website for example, calls the practice "rhetoric [that] lets the real culprits of the overpopulation crisis—greedy breeders and the 'pet' trade—off the hook and keeps them laughing all the way to the bank." Shuster knew she was onto something early on. One of the first shots that blew up on social media was that of Charlie, a German shepherd/Belgian Malinois mix who had seen better days. "I grew up with German shepherds, so they're near and dear to my heart," Shuster says. "He had come in and they had transferred him from another shelter; he was really emaciated, missing a leg and, you know, in pretty sad shape." A couple of minutes in front of the camera later, the mutt got a second lease on life. "He had this amazing personality," she recalls. "It didn't matter what had happened to him or where he'd come from, he was this very sweet and loving dog." She remembers posting the dogs snaps around 8 p.m. "The next morning, there were three families that had come in to meet him," she says. 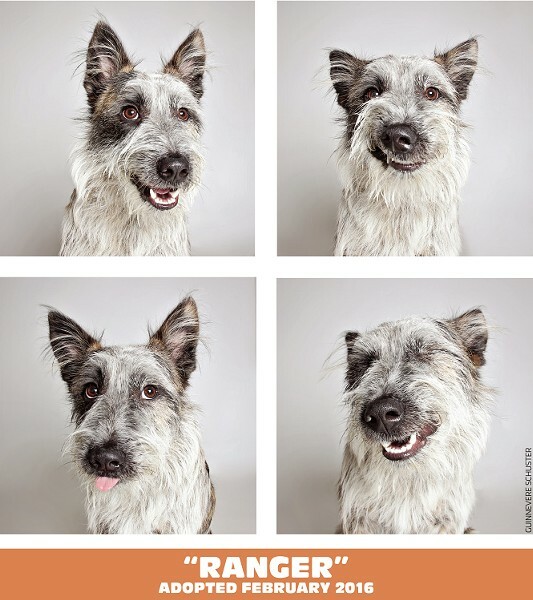 Another way the photographer is helping to find forever homes for animals is through Shelter Dogs in a Photo Booth, a soon-to-be released book half a year in the making that features 100 of her favorite shots. Each photo includes the story about that particular dog as well as some follow-up stories. Published by Kansas City-based Andrews McMeel Publishing, the book is currently on presale on websites like Amazon.com and IndieBound.org. As expected, part of the book's $15 or so price tag will benefit the local Humane Society, as well as Best Friends of Utah, the nation's largest no-kill sanctuary for companion animals. "Hopefully it will do well, and it will show people the different types of dogs they can find in shelters," Shuster says. "Different shapes, sizes, age, breeds—I tried to get 'em all in there." 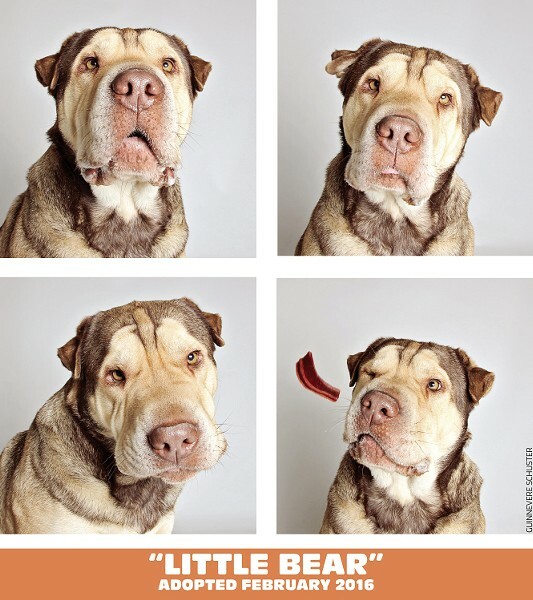 Deann Shepherd, Humane Society of Utah's director of marketing and communications, says she's seen Shuster's work "improve the adoption impact," and says her style is now being emulated across other markets. 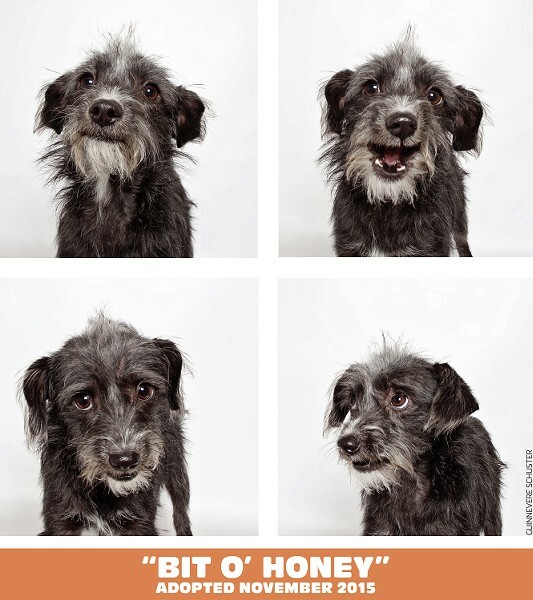 Echoing the saying "Imitation is the sincerest form of flattery," she notes, "Especially when it started to hit the Internet, and it started to go viral, we saw a lot of other shelters using the fun portrait style against the white background." "However," she continues, "[their use of Shuster's style] is not a bad thing when the whole idea is to help animals everywhere. Guinnevere has actually consulted with other shelters and held workshops for those who have called us asking, 'What have you done to promote your animals so well?'" Shepherd says that shelters using photos of animals where they look intimidated or scared isn't doing them any favors. "A lot of the animals don't come to us because they did anything wrong," she says. "These are great family pets. The family may have moved to a location where they can no longer keep the pet, so they bring it to us—which is great because they're thinking of the best interest of the animal." Along with the jazzy pics, Shepherd credits other factors that have helped spike adoption. In 2012, HSU doubled the square footage of the facility and, two years later, it introduced "Dawgville" and "Tiny Town"—a couple of relaxed, size-specific kennel alternatives where adoptable pets can commingle with their would-be forever owners, though she quickly circles back to Shuster's work. "It can be a great campaign, but if the images aren't strong, they aren't grabbing people's attention," she says. "A picture is worth a thousand words." Those words also come in handy, Shepherd says, when lobbying for animal welfare during the legislative session. "If we put out a notice about something we're working on," she says, "it reaches more people because she's maintained a high engagement on our social media." The physical space where the magic happens is a tight, square, windowless room with a filing cabinet, a rolling table and a large white backdrop duct-taped to a metal frame. On top of the filing cabinet is a bag of treats, which Shuster breaks into tiny puppy-size pieces. Below the table, a couple of boxes filled with props are stashed. Shuster quickly exits the room and returns holding one of the caramel-colored pups I had contemplated nabbing for myself. She believes he's a Chihuahua mix but isn't sure. She places him on top of the rolling table and proceeds to spoil him with treats. This is where the mastery starts to unfold. In order to get him to look at her, Shuster holds a teensy treat above her head and lets out a high-pitched, maniacal trill, one that would give Mariah Carey a run for her money. The pup is mesmerized and poses perfectly. Annie Leibovitz, eat your heart out. Next up is Charlie, a 9-year-old long-haired Chihuahua mix. His nonstop tail wagging creates the most adorable furry fan. The photog pulls out the big guns: a peanut butter-dipped Beggin' Strip. Charlie takes a tentative lick/nibble and, from the look on his little fuzzy face. I can almost hear him exclaim, "The hell woman? What is this rubbish you're trying to pass off as a treat?" While he licks around the peanut butter, his face distorts into the most delightfully charming expressions that Shuster captures with her rapidlyfire camera. With only the peanut butter portion of the treat left, Charlie grudgingly finishes it off and gives the table a final lick for good measure, providing Shuster with a few more shots. As I stand to leave and thank her for taking the time to meet, I can't help but feel more than a little hero worship. The fact that Shuster is so humble about her work and the importance of what she is accomplishing in championing the plight of shelter animals restores my hope that there are still plenty of good people willing to work on behalf of those who can't speak for themselves. Shuster's talent and determination is as clear as her message: "There are a lot of really great animals in shelters. There pretty much isn't anything you can't find these days in a shelter, or rescue group, that you could get from a breeder." She continues, "We've had everything from 8-week-old labradoodle puppies that you could buy from a breeder for $2,000. We just had a Corgi puppy a couple weeks ago. It might take a little time and a little extra effort in your search if there's something you're looking for specifically." Her spotlight also shines for older dogs. "At certain points in people's lives, maybe it's better to get an adult animal," she says, urging would-be adopters to be open minded. "A lot of people think shelter animals are damaged goods or there's a problem with them and that's the reason they're in the shelter, when a lot of times people just run into problems."